How Well Are You Adapting to Today's Trust & Value Economy? The downturn has fundamentally changed the market. Customers are now in control. Price competition has intensified at the same time that the Phase I environmental site assessment practice is expanding to require expertise in new areas like vapor intrusion and file reviews. Pressure to deliver reports quickly and efficiently has also intensified. Doing more for less is the new name of the game. What does this new dynamic mean to your client interactions? How well is your firm adapting? Join this free webinar with internationally certified coach, speaker and author, Meridith Elliott Powell, for an engaging presentation on today's dynamic market environment. She will explain how you can use trust and value, not low price, to your competitive advantage in today's value-based economy. Powell will also share her proven tips for marketing services in today’s economy and how you can create a unique identity for your firm. 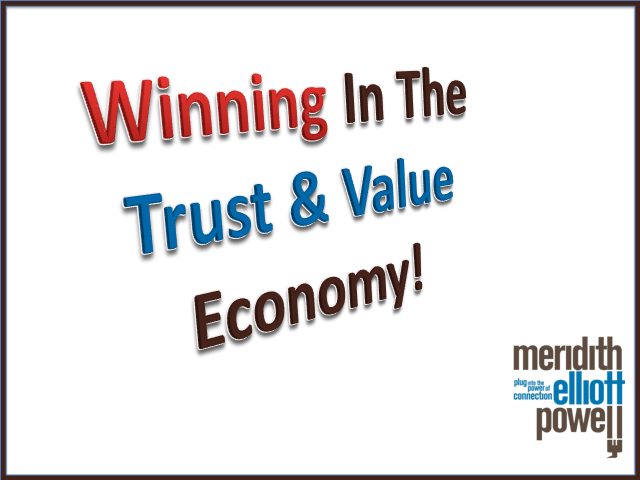 Title: How Well Are You Adapting to Today's Trust & Value Economy?